Unsurprisingly, different fish demand different flies, which in turn demands different materials, often in different sizes. 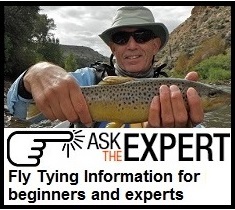 Selection and experimentation of those materials is a great part of the allure of fly tying. It can seem overwhelming. Our novice’s guide is to help you on your way by sharing some of our favorite basic materials as we have with our tools selection. The materials we’ve selected will allow you to tie a wide variety of flies for fishing on the surface and through the water column. You can find our selections by searching for the number preceding the item, e.g. “F3502,” will lead you to our thread choice. If you prefer, you may purchase our materials, and/or tools selections with one entry using the appropriate category number found at each heading. We’ve listed our favorite colors, but feel free to add or substitute your own. Have fun with it! Saltwater fishing is so diverse that it simply doesn't lend itself to a standard novice kit. Our Bass, pike, and saltwater tools list is a good start for the hardware. Saltwater flies' more substantial hooks, even in the smaller sizes, and the need for more durable materials, make saltwater close to our Bass materials list. Still, it's best to decide what species you will pursue, select a few simple fly patterns, and follow their materials lists. We can help you sort it out to get you on your way.